There are, of course, some other major liabilities of the state. As discussed by The Informed Vermonter under Vermont Employee Retirement Benefits, the state has two defined benefit pension plans (the Vermont State Employees Retirement System and the Vermont State Teachers Retirement System) and two other postemployment retirement benefit schemes for health care (the Vermont State Postemployment Benefits Trust Fund and the Retired Teachers Health and Medical Benefit Fund). Each year, Vermont estimates the total future liability of these retirement programs as compared to the value of the funds that are dedicated to support them. Assuming the assumptions used for these estimates turn out to be true (average lifespan, future cost of living increases, medical cost inflation, investment returns etc. ), the aggregate of current employee contributions, retiree contributions and state contributions will need to be sufficient to meet this estimated $3.8 billion liability over the next 30 years. In fiscal year 2016, the state contributed $176.4 million to these four programs. Those contributions, plus current employee contributions and investment income, failed to meet the total administrative cost and benefits paid resulting in an aggregate annual deficit of $56.9 million. Absent a material increase in investment returns (which are now very low given the interest rate environment), it would appear that the state will be making large annual contributions to support these plans for the foreseeable future. 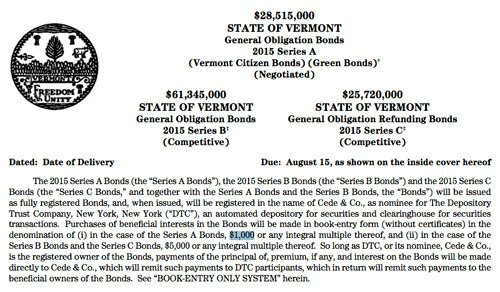 The towns of Vermont are also carrying a large unfunded pension liability, which totaled $128.7 million in 2016. While the state manages the underlying investment of the MERS municipal retirement fund, it is not on the hook for the liabilities. These are divided among the municipalities themselves.